The Iranians are bringing missiles out of their bunkers and within an hour and a half they will be prepared to “push the button” and launch the missiles at any point in Israel. Against the time that is running out, a drama is being reconstructed. It is a political, scientific and human drama that took place in Jerusalem and Paris during the 1950's - 60's. At the center of this story are the Head of the Mossad as well as a key Nuclear Physicist together with his doctoral students. They are recruited to develop the bomb for Israel. The mission seems impossible. The tense and romantic relationships between the characters are presented against the background of the determination of the Head of the Mossad to attain the Bomb and the soul-searching of the physicists who understand the terrible significance of this project. 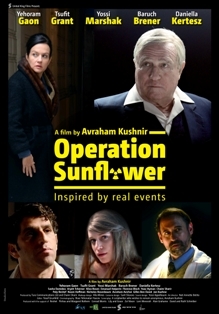 Operation Sunflower also deals with the dilemma of the commitment of the Jewish People around the world towards the State of Israel and how far will they go in order to help the Jewish State. The Story that unfolds in the film, in the words of one of the characters, "was mythical".